Does anyone remember when push up pops came out? I think maybe early 80’s? Theye were mostly Flinstones themed if I remember correctly, and made up of brightly colored sugary yogurt? Yes? No? Am I just aging myself with this stuff!? Well I remember those vividly. Because my mom wouldn’t buy them. But my neighbors mom would (Hi Susie M- that was you!!) So my little brother and I would beg and beg to go over there so we could maybe have a Flinstones Push up Pop. I don’t think it was the day glow colored yogurt that was so interesting as the actual “push up” apparatus! When I saw those for sale last year, I impulse purchased, and had completely forgotten about them until this last week. The weather has been nice and of course the girls are craving ice cream and popsicles. I was too lazy to get out the ice cream maker and make homemade sorbet for Pia, and I don’t like her to have the sugar free popsicles more than every once in a while- because well, yuck. SO, I had to make some of our own. That is when I ventured down to the basement to find popsicle molds and found these instead! I just blended up this delicious combination below and poured them in. A few hours later, the kids came home from school to this fun frozen treat. Perfect for the hot holiday weekend, and kids love making them with you! 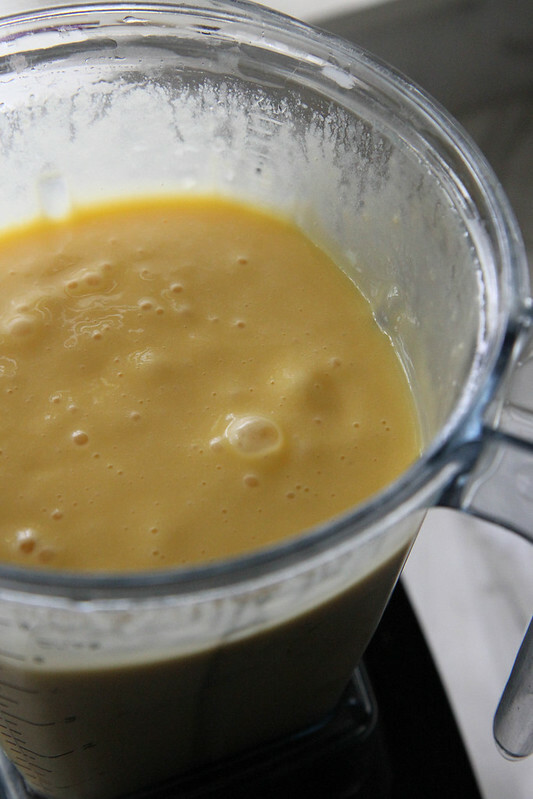 Pour all of the contents into a blender and puree on high. 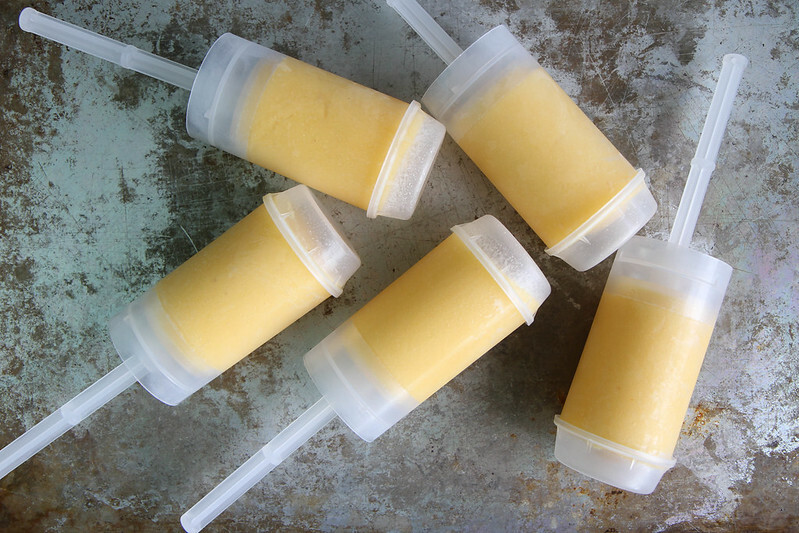 Pour into push up pop mold or popsicle molds and freeze until solid. Enjoy! I totally remember those! I love push-pops for popsicles. These are awesome. 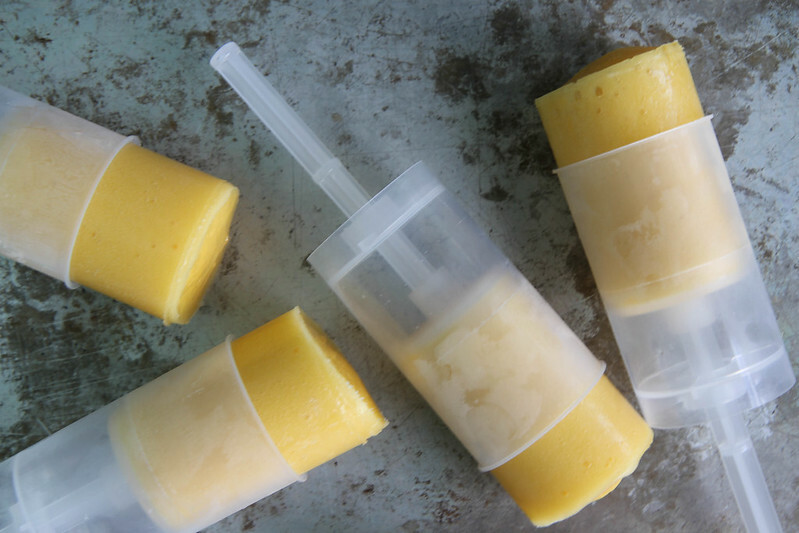 Such a super creative idea and mango, vanilla, honey – what an awesome combo! And loving those plastic holders. I need those! Love the flavour of these!! They look awesome! 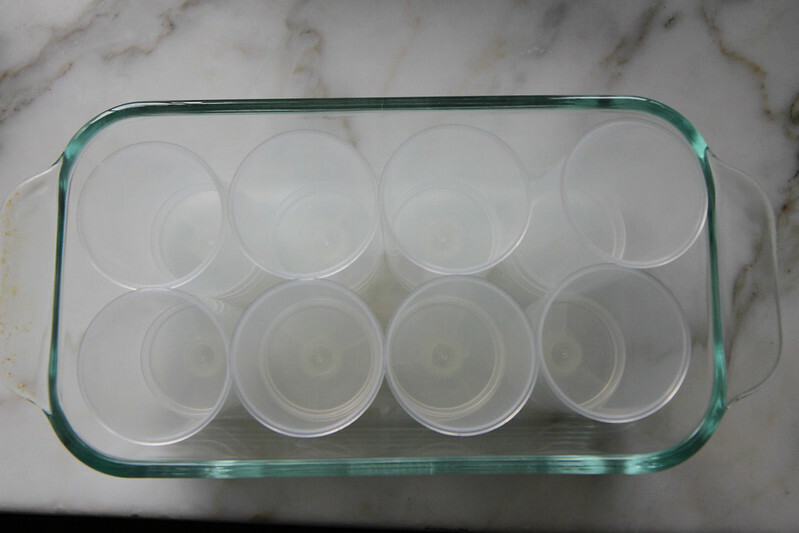 I have to get some of those molds—where did you find them?! My kids would go crazy for these. Please tell us where you got the push up’s from?????????????? 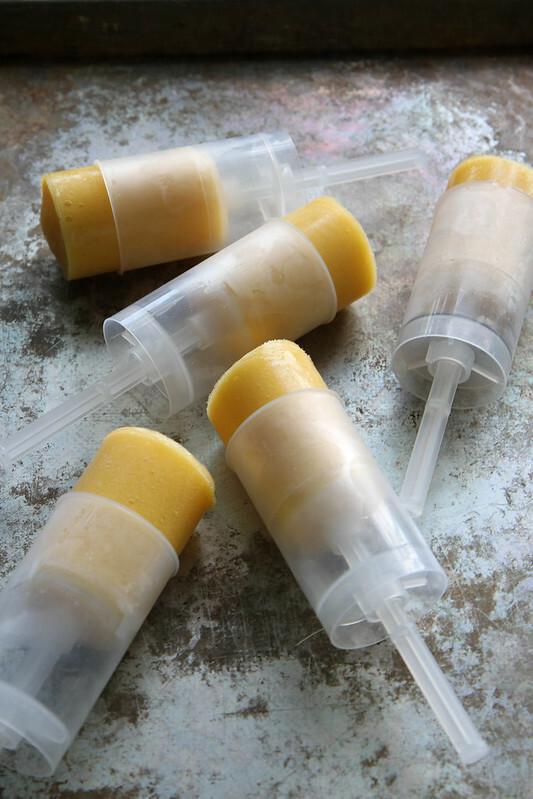 These look sooo yummy and I have a set of these push pop molds so I can’t wait to make them! Oh good! I can’t believe how many people have them lying around and just never got around to using them! so many possibilities- have fun! Heather!!! I wasn’t allowed to eat push pops either!!! I absolutely need to give these a try. SO cool. Yes, I remember the push pops! I believe they are still around but not nearly as popular as they were in the past. I remember eating them in the late 80s and early 90s. Thanks for this fun trip down memory lane. They probably are Connie- but I bet what I once coveted would be absolutely nasty now! I think I will stick to these homemade ones! 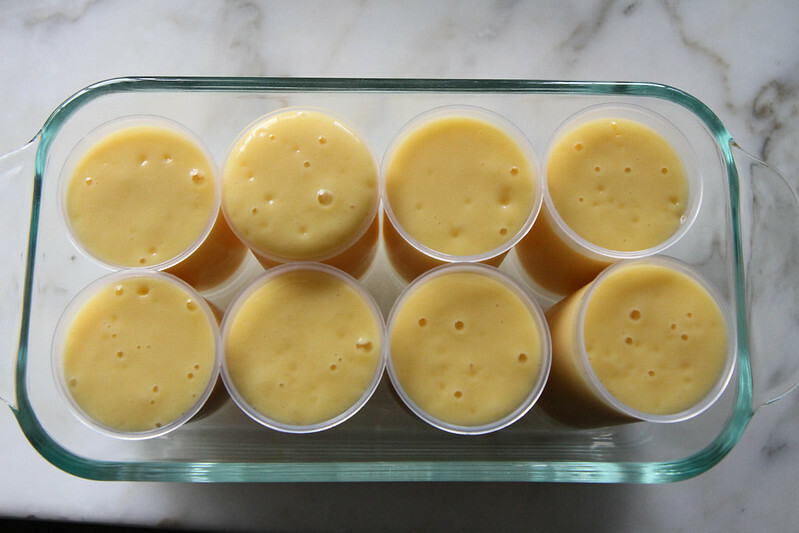 These are so fun, I need to stock up on mangoes so I can make a batch this weekend! FYI Laura- i just used frozen mango, but I am sure fresh would be twice as good! Oh how I love the flavors in these pops! Thanks Marla! You are like the queen of pops, so I appreciate it! Oh man, push-ups were the best! These sound like a much more pleasing alternative, though. 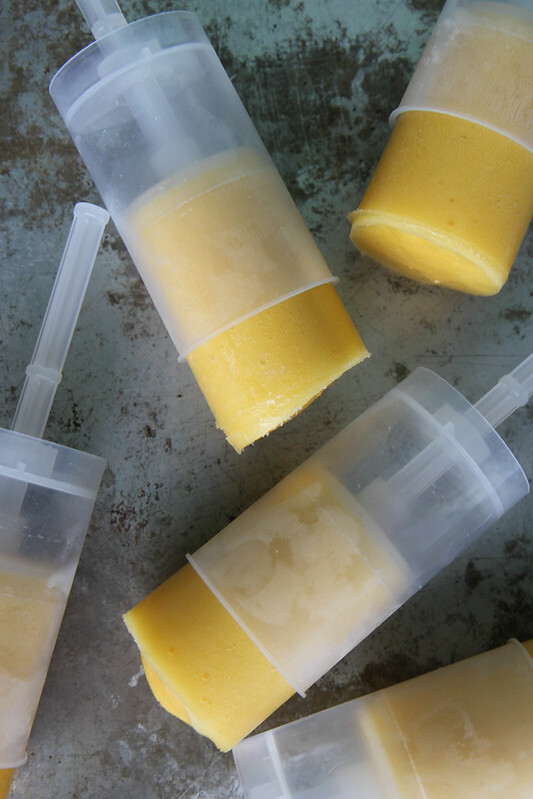 Homemade super-fruit popsicles for the win! I remember those pops! We hardly ever got them. I can not wait to try these, my kids will go bananas for them. totally Colleen- they were the forbidden sugary treats for us! But these are healthy and I think most kids would love them! Omg, push pops were my jam when I was young. I’m a child of the 90’s so I think they were definitely still popular then and I LOVE that you have struck a chord with my childhood memories with this recipe!! OMG! I have push pop cake molds still in the box that were given to me as a gift. I have had no idea how to use them since I am not into the whole push pop cake craze, but this…this I can get into. Thank you for being a genius! Meg- those are way better off used for frozen treats than cake in my opinion! Push up pops were around in the 1950’s – red and white stripe cardboard containers. The orange sherbet was the BEST!!! Creamy and sweet. We would sometimes get one as a treat when Mom would load us all 5 of us kids into the Chevy station wagon to drive the 2 mile trip to The Market – a very small general store with a post office and egg candling services in the back – in a very small community – maybe 60 people. The real reason for the trip was not push ups but The Bookmobile. All of us would check out as many books as we could carry in our skinny little arms. The librarian on the bookmobile was the reason I became a librarian. She opened the world for all of us through books. Hundreds and hundreds of books. And yes I did drive the bookmobile in one of my jobs as a public librarian. Best job ever. These are soooo fun! 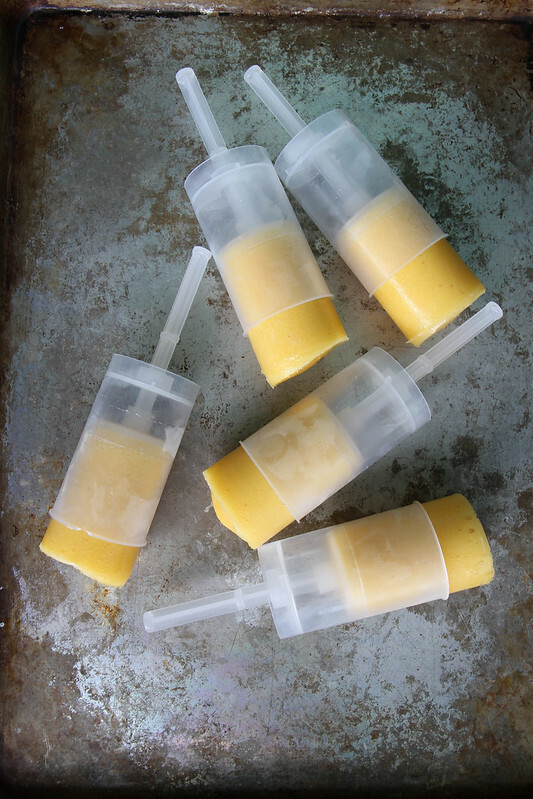 I need to get some of those push pop molds for summer ASAP! these are perrrrfect!!!!! they bring me back to my soccer game days when i was little! Pingback: Blast From the Past: 13 Nostalgic Ice Cream Treats From Your Childhood - Chocolate Chocolate and More! These look great! I am always on the lookout out for yummy hot weather treats! Can you substitute regular whole fat milk for the coconut? Thanks! Made these today. We used LOTS more vanilla because my kiddo loves his vanilla! I just got them on Amazon!